As the pastry chef at one of New York City’s most acclaimed restaurants, Nancy Olson makes everything from madeleines to mousse. But some of her favorite desserts are still the ones she grew up eating in North Dakota. 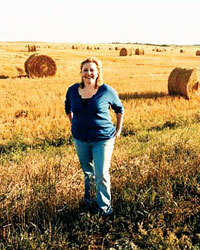 Pastry chef Nancy Olson virtually grew up at her church in Napoleon, North Dakota. And every year, she looked forward to its many potlucks, especially the desserts: "The casseroles weren’t for me," she says. Recipes for many of those desserts were compiled in the church cookbook, second in stature only to the Bible. Now pastry chef at Manhattan’s Gramercy Tavern, Olson tweaks those homespun favorites to perfection. Her kuchen, a custard-and-fruit dessert of German origin, easily rivals the myriad kuchens in the book. And her chocolate–peanut butter layer cake is the brilliant marriage of her mother’s chocolate, peanut butter and Rice Krispie–topped brownie (a church-cookbook favorite) and French pastry chef Pierre Hermé’s "sweet pleasure," made with milk chocolate, hazelnut dacquoise and a crunchy praline spread. You’ll find Olson’s kuchen and layer-cake recipes here, as well as her other hometown favorites. Gramercy Tavern, 42 E. 20th St., New York City; 212-477-0777.